Welcome to the Summer Sweep to Win Event! This Giveaway Hop is hosted by the Blogging Mamas Network! 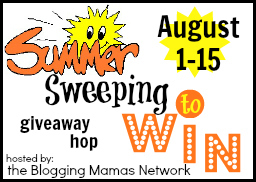 Myself and other Blogging Mamas Network bloggers are bringing you LOTS of chances to Stay cool and keep Summer Sweeping! So be sure to hop around to all the other giveaways at the bottom of this post before the event ends on August 15! Each blogger linking up has a Giveaway for you worth at least $25, so be sure to hop around to them all! 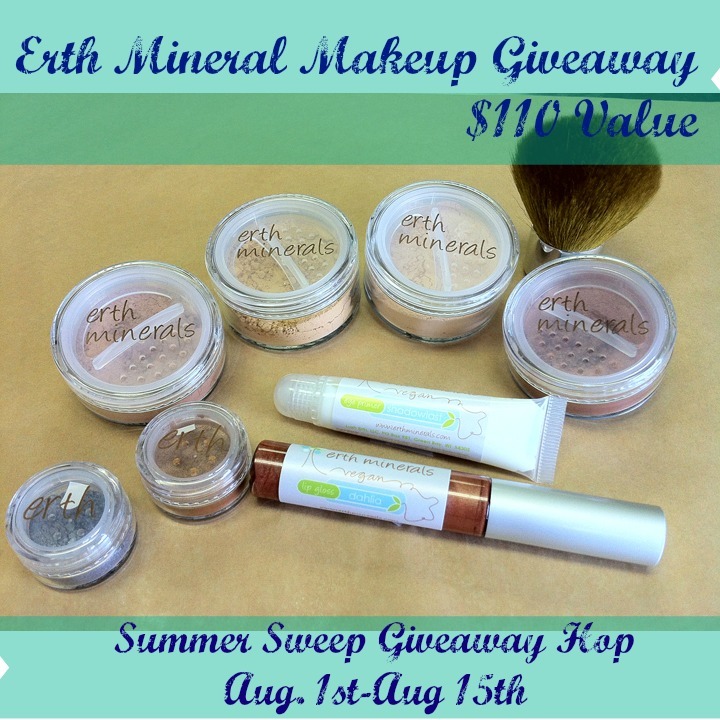 Here on rays of bliss I have teamed up with Erth Mineral Makeup and we are giving you a chance to win $110 worth of Erth Mineral Makeup! I recently took a Natural Challenge and switched all my makeup to natural makeup. While making the switch I found Erth Mineral Makeup and fell in love with it! You can read about my experience here The Natural Challenge: Switching to Natural Makeup Easier then I thought! Now here’s your chance to get your hands on this great makeup. It is high quality makeup and I personally use it everyday! I’m so happy to get to share it with all of you! and a Chrome Kabuki Brush! This giveaway will end at 11:59 pm EST on August 15th. Open to US residents, 18+ only. Maybe you’re like me and can’t wait for the giveaway to end, and you want to try this makeup now! Erth Minerals was gracious enough to offer rays of bliss’s readers a 25% discount! They offer several sample kits and this would be a great way to give them a try with a discount! I would highly recommend any of their products, but my favorites are their eyeshadows and their Shadowlast Eye Primer! HOP DISCLOSURE: This contest will run through August 15, 2013. The winner will be chosen the following day and announced on rays of bliss. No purchase necessary. US entries only. Must be 18 years or older to win. I was under no obligation to review this product. Nor was I under any obligation to write a positive review or sponsor a product giveaway in return for the free product. This promotion is in no way sponsored, endorsed or administered by, or associated with, Facebook. You understand that you are providing your information to rays of bliss and not to Facebook. Please note that rays of bliss, According to Jenny, So Easy Being Green, the Blogging Mamas Network, and the Summer Fluffing participating bloggers are not responsible for sponsors who do not fulfill prize obligations. The sponsors, in most cases, are shipping their items to you directly. I will make every effort to assist you obtaining your prize. If there is an issue with a sponsor, please notify the blog you won a prize from within 4-6 weeks for assistance, after that we may be unable to assist you. Both! I want a good for my skin natural, quality make-up! 🙂 Thanks for the review and giveaway! It just feels and appears so much healthier to not cake it all on with makeup that has chemicals and additives to it. I’ve been exploring all natural makeup, and this would be a great chance to try out another line! I would like to try this make up becuase of it’s friendly ingredients. Natural is always good. I like that they only use the finest ingredients! I would love a makeup that is all-natural and easy to use. I’d like to try their foundation. It just looks like nice light, natural makeup. Both!I would love to try this line of makeup! I have heard so many wonderful things about mineral makeup and would love to try it. Reason is because I’ve tried this makeup before and love the way my skin feels. My skin is sensitive to makeup that has a lot of chemicals, and this makeup is all natural and made with the best ingredients for my skin. The colors are amazing and the makeup blends well! I’m trying to be more mindful of what I put in and on my body but I haven’t made the switch to all mineral makeup because my skin is super sensitive and it makes me nervous! It seems like this is a good brand though and I love all the different eye shadow colors. I would love to own their makeup because I’m sensitive to many traditional, chemical-filled makeup. I think what you put on your body is as important as what you put in it. I want to own this mineral makeup because it is natural and I really like wearing mineral makeup. Thank you for the amazing giveaway! I would love to own Erth Mineral Makeup because it is all natural and I would feel better putting that on my skin! I also love the colors…gorgeous! I think it would be a lot better for my face than the makeup I currently use! I would love to win bc Ive been looking for some natural makeup just like this! having a child, its important for me to use as many natural products as I can around her. this looks wonderful! I want to own this mineral makeup because it is natural and I really like wearing mineral makeup because it tends to stay on and not clog my pores. The Mineral makeup set is supposed to be good for sensitive skin which is what I have. I have been looking for all natural makeup! I don’t use any now because of the chemicals! I would love to win! Thank you!! I have sensitive/damaged skin due to Lupus. I would LOVE to win this makeup because it is natural and I believe that it would help cover much better than other types of makeup. I love mineral makeup and I am always looking to new brands to try! I have oily skin and love the mineral products they don’t clog my pores. Yes! It is definitely because of their natural ingredients…I cant stand not knowing what I am putting on my face. Winning would go a long way to transitioning to all natural beauty! My skin in very sensitive and natural products are the way to go for me! I think it sounds so much healthier than the makeup I’m currently using! I like natural products, no chemicals on my skin. I do love that they are an all natural product, And I am always looking for something better to cover my face with, I don’t like having to cake my face for coverage! Yes, I would love to have more mineral makeup. It is better I think for your skin than regular makeup. It would be fun too! I would love to own this for the high quality, natural ingredients! 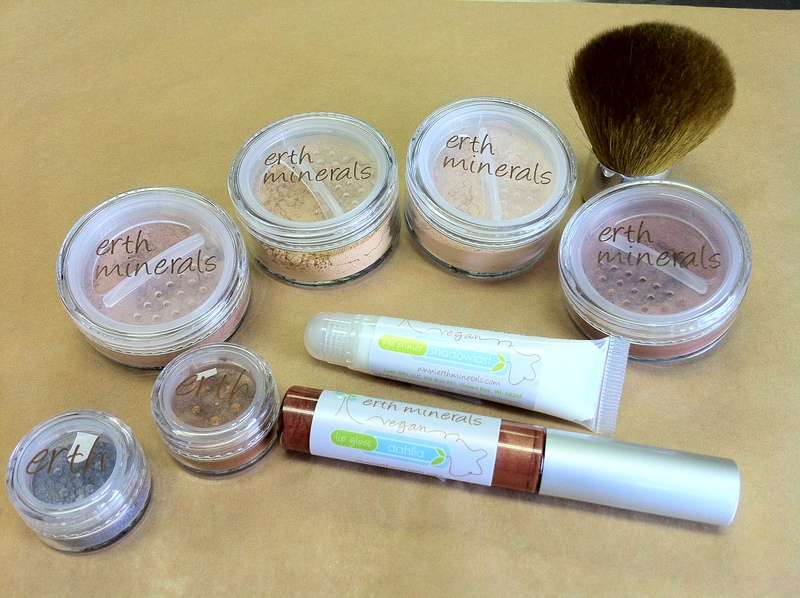 I would definitely love to own Erth Minerals cosmetics because of the all natural ingredients! I am really trying to remove as many harsh chemicals from all areas of my life as possible, and this cosmetic line is exactly what I’m looking for with my makeup! Thanks for offering this giveaway, and God Bless! I would like to try their products because i have never used them and I would like to use more natural products . I’d love to have the organic skincare kit! I don’t like to put chemicals on my face so i’d love to try as many natural products as I can! I have been using mineral makeup for years now and I like it because the ingredients are more natural and better for sensitive skin like mine. I also think the coverage on mineral makeup is awesome without looking cakey and yucky. I appreciate the all natural ingredients, the light and clean feel, as well as the coverage of my brown spots and redness. I need a new foundation badly. I bought bare minerals (costs a small fortune) and didn’t love the product. I have super sensitive skin so I read all labels. These ingredients are so particular I would loooove to try it. I’m willing to bet they won’t irritate even my sensitive skin. I no longer use any skin care, soap or other beauty products that have any parabens, SLS or sulphates. Lipstick, blush and mascara are the only things left for me to switch over [I don’t use foundation … will give that to my mum if I win] so I’d like to try the Earth Minerals.